This page is dedicated to "All Annalee Collectors". Please send articles on how you started collecting Annalee Dolls, Annalee traditions, interesting stories concerning Annalees and of course, photos. I want to say thank you for putting my order ahead and getting it delivered on Thursday (12/20) even though I didn't order until the 18th. It arrived, I got it wrapped and gave it to my friend and she loved it. It was the Cozy Christmas Pug. I didn't think it was possible but you pulled it off and I much appreciate it. I will mark your web site for future reference. Again, thank you and I hope you had a good season (we are small business owners so I know that is a good wish) and I wish you very Happy Holidays. Best regards, a satisfied Custome. Janet W.
In October, our town hosted it's annual Scarecrow Building contest. 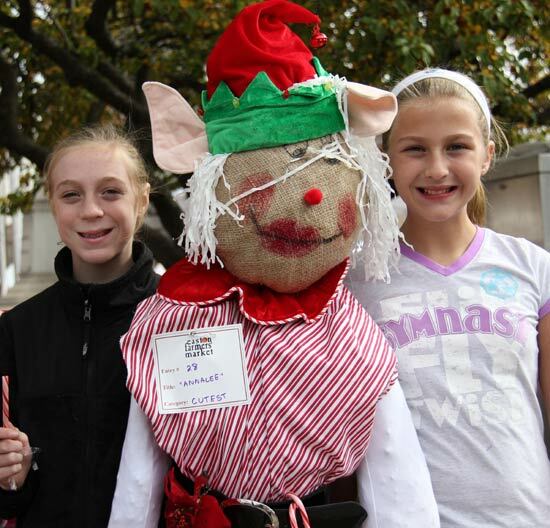 We decided to make an elf scarecrow because of our love for Annalee elves. We planned how to make the outfit. Kelsey and her mom sewed the dress, Tess and her mom found the perfect hat (it even sang a christmas tune!) and other accessories. Together we stuffed the outfit with straw and made beautiful and really cute elf scarecrow. We named it Annalee. We had a lot of fun and everyone loved it! Even though it's only October....it's never too early to think about Christmas and Annalee elves! just wanted to say Thank You! The two Christmas stockings you sent are perfect! I love them! My collection looks wonderful! (And all the stockings are hanging in the same direction!) The Cozy Elf is awesome! I love that I can bend it and shape it. Cooper (my granddaughter, whom I purchased it for) loves it! At dinner time she was waving at it! I'm really glad I got the bigger size Cozy Elf, it will be easier for her to find it this year! We're going to have fun looking for it each morning! I appreciate the time you spent helping me make my selections. Thanks again and Merry Christmas! D.R. Spring is one of my favorite time of the year, not only because the dreary winter has passed but the whole world seems to awaken. The fish in my pond come to the surface looking for food, the crocus appear in the garden and the sound of children can be heard. 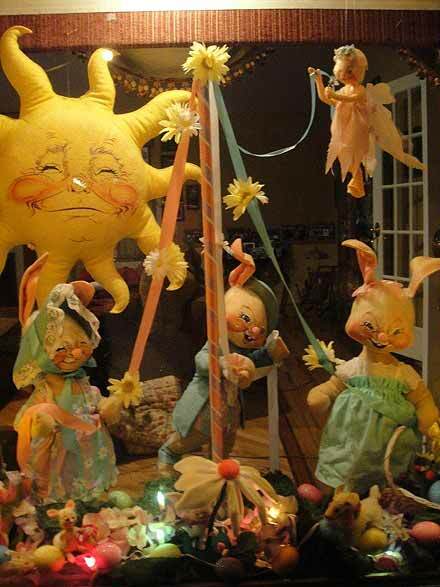 My husband and sons start to get the family amusement park open and I start rummaging through my spring Annalee dolls to come up with a new idea for the season. I have always decorated for the holidays doing a showcase in my front windows. A few more decorations are added every year. This year my oldest son came home and said he thought I was a "little over the top". He always notices my decorations and notices when they are not up. So I actually think deep inside he is more like me then he wants to admit. I usually do not ask my family of all men for help, because they think standing a bunny in the window will suffice, but they do enjoy them when they are done. This year, I not only involved my family but our friend Allen. I decided to go with the idea of carousel. I looked for animals that my spring elves could ride. The elves have a face that you could put anywhere; they are always looking like they are having fun or causing havoc. With the help of Sue I added children, and some more fun characters. After building my carousel, turning it on and watching it fall apart for the third time I had to call in the top guns... my husband and Allen. In no time they were able to get the canopy frame to stay on. 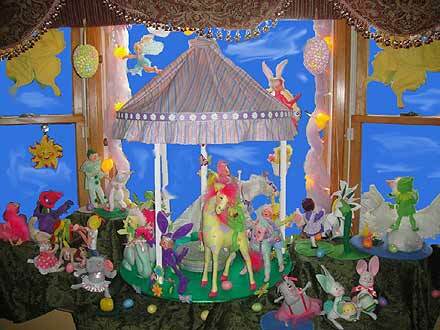 I added the fabric and my carousel was built. I was so excited, I placed it in the front window and decorated around it. I created a little scene of a beautiful spring day of just having fun. There are children eating ice cream and cotton candy. There is a clown holding on to a falling basket full of chicks, and also a rooster and chicken out for a stroll. You will also find an elf riding a spring swan. 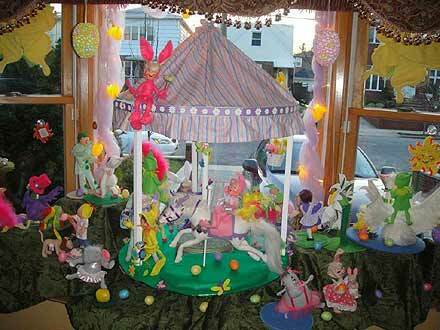 It has to be one of my favorite displays, besides my all time favorite bunny maypole with a little fairy flying above playing along. Dear Sue, my eight year old daughter, Haley absolutely loves Annalee elves. She will talk about them to anyone who will listen. She takes them in the car with us whenever we go out. They have now become a part of our family after only a short period of time. I love to see her excited face when she catches one in the mailbox. Also, the anticipation as she searches the house to find where they have gone while she was sleeping. Sometimes, I even hear her talk to them and who knows maybe the magic is so strong that she hears them too. It makes me so happy to see her fall in love with this adorable collection. They truly are spectacular pieces of art. My favorite memory about Haley and the elves is when she stumbled upon the Sue Coffee website. I am not joking when I tell you that she looked at the website for hours. She kept calling me over to the computer to show me all the neat things she had found. She couldn't believe that she could now by the older elves. She calls them the hard to find elves. She was amazed by this website and immediately added it to her favorites. Her list from that day continues to grow but her favorite one that she keeps hoping to catch is the gymnastics elf. If it doesn't arrive soon I am sure she will use her birthday money to buy it. I keep telling her maybe the Easter bunny will drop it off. You never know when it comes to these special elves. Dear Haley and Nicole, thank you for sharing your Annalee enthusium. 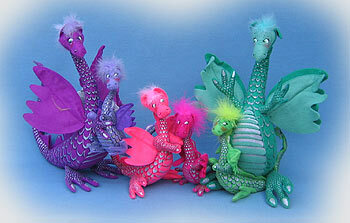 It brought back all the fantastic memories and excitement of when I started collecting Annalee Dolls. I know exactly how you're feeling. The excitement of collecting Annalee Dolls is contagious. I have to share this story...I was talking on the phone with Nicole, Haley's mom. We were discussing Annalee and the times I visited with her at her home and when we went out to dinner. Nicole would repeat out loud everything I was saying to Haley. I could here Haley in the background asking questions, so I asked to speak with Haley. Nicole asked Haley - NO way..........too shy. Seeing as my daughter Calli is also very shy, I knew what I was up against! Immediately I asked mom how she felt about me giving Haley a free doll if she talked with me? Mom blurted out..she'll give you a FREE doll if you talk with her! Suddenly, I heard this very soft "hello". Priceless! Sue, It was a pleasure talking to you this morning. I just wanted to tell you the reason why I like you and your company. First of all you give that personal touch and that really got me hooked. When I received that personal message on my invoice in your hand writing, I thought what a nice person to even care. In this day and age, when we don't get that customer service, it was a plus. I know I just had a run in with a company and their customer service and I will never darken their doors, but let me tell you I will always buy my Annalee's from you. Secondly you get the product out so quickly and I get so excited when I receive the package with my Annalee's. Thank you so much for your kindness and fast delivery. I just wanted to say how impressed I am with your service and your knowledge of Annalee Dolls. I called you looking for a doll that was lost in a move over 5 years ago. I really couldn't remember what it looked like exactly. When you began asking me questions to try to get some "clues", it started to come back to me. To my amazement, you had the doll in stock and I received it the next day! I just LOVE the dolls that I ordered from you. Thank you for taking the time to discuss all my options with trying to find a companion for my Mr Santa. By the way, my order did come the next day. I can't believe that they came so quickly. I was so happy and so thrilled!!! I just received my Annalee Cupid. He is adorable! I'm very lucky to have purchased your last one. I will display him proudly. 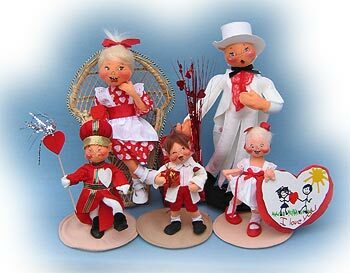 My grandmother was an Annalee collector and this wonderful cupid brings back many happy childhood memories. Thank you SO much! I also appreciate the catalogs you sent - I'm sure you'll be hearing from me soon. 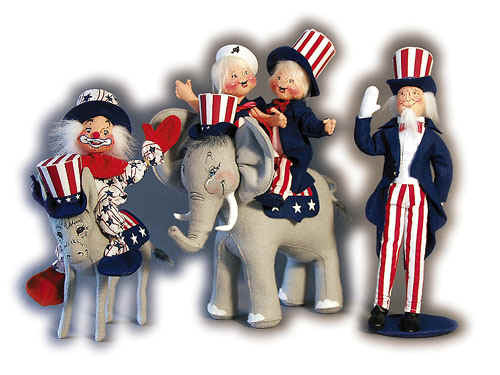 I love the idea of continuing traditions through collectible decorations. Long time Annalee collectors Adele Shanbar and Linda Carafa have more than collecting Annalees in common. They are about to become mother-in-laws and create an Annalee extended family. Their children Jen and Bob plan to wed on Dec 6th. They did not know each other prior to their children falling in love, but after getting to know each other they realized they were both avid Annalee collectors. They even have many of the same dolls in their collections. For those of you Annalee maniacs, I'm sure you can relate to this story: Adele noticed a 23" witch that Linda had brought in to use for decorating the room. Since she did not have one of them in her collection, she asked Linda where and when she got it. Since it was produced in 2003 and no longer available Adele immediately called Sue Coffee the next day and ordered it. Annalee dolls with the Halloween theme were used to decorate the bridal shower. The table centerpieces consisted of Annalee cats, pumpkins and cauldrons accented with Halloween candy. A wedding trivia game was played and the centerpieces were given as prizes to the winner of each table.Bridesmaids, mothers and grandmothers wore an Annalee Pumpkin Pin to stand out from the crowd.The cake was decorated with ghosts, pumpkins, black cats which complimented the theme of the celebration. The majority of the attendees dressed up for the occasion. Let's just say, there were a lot of witches in the room that day. Not only are the two mothers collectors, but the bride is also becoming an avid collector. Rumor has it that she will be giving the two moms competition when it comes time to decorate her home for the holidays. The grooms comment to all this Annalee mania... "not only did I have to put up with my moms Annalee decorations all these years, now my house is going to look the same." Have a great time at the wedding and congratulations. I would like to comment on the fantastic customer service I received from Sue Coffee. I was looking for a spefic Annalee Doll retirement gift for a very dear teacher/golfer friend of mine who collects Annalee. The poodle golfer. I called her at 9:30 am on a Friday, she quickly placed my order for FedEx to pick up and have delivered to me on Saturday at no extra fee. I received the package before noon for a luncheon I had with my friend on Monday. Now that's service!!! What a blessing it is to find someone who is not only an expert on the product they sell but is also compassionately caring about you as a customer and individual. This site is easy enough for my 80 year old aunt to shop on and I was so impressed we had to join the club. Sue is one of those people you want as your best friend and I consider my time with her this morning a blessing. I can not recommend this site highly enough and we will be doing all of our Annalee shopping with Sue. God Bless you Sue and thanks for an awesome shopping experience! Thanks, Debbie in Boise, ID"
Sue always delivers EXACTLY what she shows/describes/promises. Feel free to call/write/e-mail questions regarding ANY Annalee, and Sue will answer promptly and thoroughly. Many of Sue's items ship for free, but if not, her shipping is super fast/combined/reasonable. I know I can trust Sue with all my Annalee needs! absolutely loves his dragon, wizard and Dracula. I order from you is EXACTLY as described. A new order will be coming sooner rather than later! "Dear Sue, once again I am very pleased with my order. You always send me the Annalee's with the faces I would have chosen if I could choose them myself! They are always perfect and I get my order fast! That is the reason I order so much from you! I justed wanted to let you know how much I appreciate the way you give such special attention to the details. Keep up the good work." Lori B.
Dear Sue, Just received my latest order and I am MOST pleased!!!! It arrived just as the tracking information said. I really don't know of another online 'shop' that is as reliable as you are! I took your advice that was in the latest newsletter which stated that the Wannabe elves will probably sell out and after getting all 4, I understand why!!! Annalee has out done themselves in the design as well as the packaging. And to top it off--the Wannabe Tree lights up!!!! Thank you very much for responding to my request for information. I have visited your website and can now date my dolls. Thank you, too, for all the research you have done and for sharing it with us. I appreciate all your hard work. 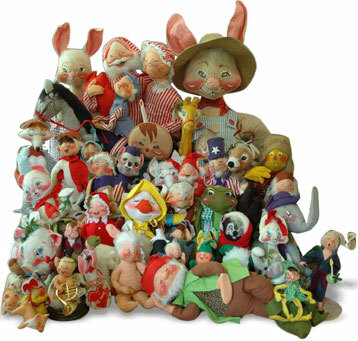 "My collection of Annalee dolls does not have the same beginning as so many other collectors. My collection started with the passing of my Mother who had only just started her collection. 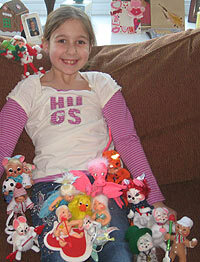 She would buy one or two each year at Xmas and she was also given a couple by close friends. With her passing they became mine. I thought this would be a good suggestion to give to my sons, for something they could give me each year, without breaking the bank, and they might enjoy picking them out and I would love to get more. I was fortunate enough to attend a Doll Society Summer Social one year and met the wonderful woman we are all so thankful for, Annalee. I missed meeting Sue, but I am so thankful I have had the opportunity to talk with her in the past and become one of her customers. 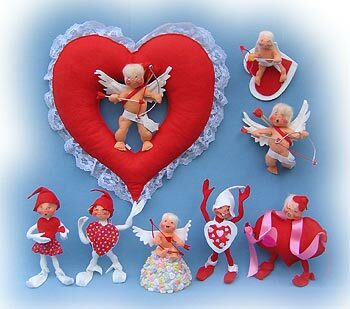 I have given Annalee dolls, as baby shower gifts, birthday gifts, and wedding gifts. I have lost count of how many dolls I have and I am running out of room to display them all, but that won't stop me from collecting more each season. My family of 8 started going to the lake in Moultonboro, New Hampshire in 1974. We found the Annalee factory store that year and I have been going to the lake for the last 34 years and collecting Annalee dolls since then. I must have at least 150 Christmas dolls and being the first generation Irish girl that I am, I must have at least as many St. Patricks dolls. I do have quite a few Easter dolls, but I prefer the mouse dolls over the bunnies. We also have 5 of the annual dolls in the glass globes starting with Anny Oakley, Johnny Appleseed, Mark Twain, Robin Hood. It is a shame that I don't have a special room for all these dolls but I have gotten my daughters and friends on starting collections as well. I have had the pleasure of meeting Annalee Thorndike on many occasions since she had a summer home in Moultonboro and was always willing to share her history with me before her passing away. I have lost some interest in collecting since they started making the dolls in China, but I know I will be back again this summer to add to my collection. 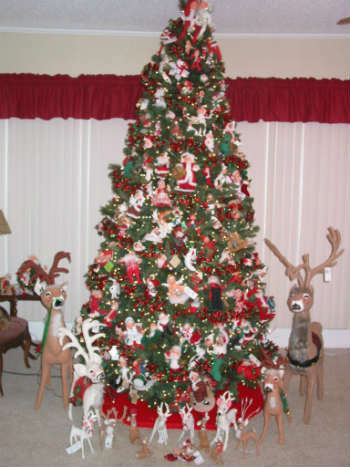 I started collecting the Christmas dolls after I saw the 36" Mr.& Mrs. Santa at a friends home. My children were very young at the time, 30 years ago and I thought they would enjoy them plus collecting them would establish a family tradition that our family would look forward to each Christmas season. Before I knew it, my collection grew to over 100, a few being Easter Rabbits, Valentines bunnies, mice, Halloween and Thanksgiving as well. My favorite of all is the 36" Monk I purchased years ago....He is always on my fireplace hearth at Christmas and it wouldn't be the same without him. Thank you Annalee for all the smiles you've given my family and myself through your wonderful dolls. I am writing to share a Christmas tradition from my childhood that I've carried over to my family this year. Growing up my mom had a red and white striped Annalee Christmas stocking with a little gray mouse in the toe. My Aunt had one also. Every year my grandmother would send our packages and stocking stuffers for my mom & my aunt. They would stuff their stockings with the stocking stuffers. They would always call each other on the phone shortly after the package arrived from my grandmother. Then the fun began. Neither one could wait until Christmas to open their stocking stuffers. My mom would sneak and open one. Then she would call my aunt to see if she opened the square package and my aunt would ask my mom if she had opened the long skinny package and share what they had received. It was usually the same item but a different color or style. This would go on up until Christmas. It was their version of the 12 days of Christmas. 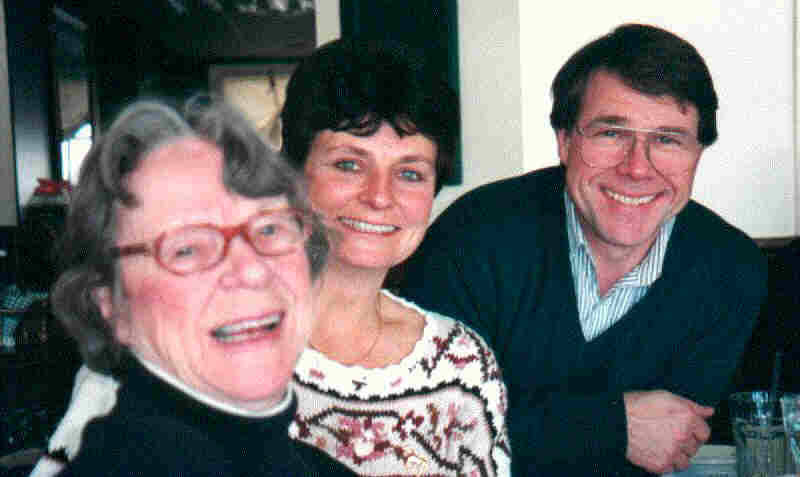 My mom passed away 9 years ago. This July while listening to a local radio station I became inspired. They were celebrating Christmas in July. This meant every other song played that day was a Christmas song. I'm Dreaming of a White Christmas was playing and I thought it would be great to get Annalee Christmas Stockings for my children (ages 10, 12 and 14 years old) and my husband & I. A little ironic because we never get snow in the valley. We LOVE the snow and only dream and visit up north for the White Christmas feeling. I found Sue Coffee on the internet and was able to find 5 different stockings for everyone in my family. I gave the kids their stockings the day after Thanksgiving and shared Grammie's Christmas Stocking story with them. They thought it was awesome and loved their new stockings & the story! In addition I purchased mice figurines for all my nieces and nephews making special cards sharing the stocking story. It was our Christmas inspiration from Christmas' past. Everyone enjoyed their mice figures and each year we can remember and share happy memories of my mom and my kids' grammie for years to come. Now we can look forward to getting out our stockings and make and share the same kind of memories my mom & her sister did. * If a doll was made prior to 1987, then the date on the Annalee tag is ONLY the copyright date, not the actual year it was made. 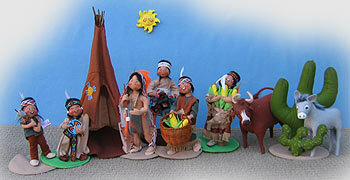 * Early Annalee Dolls did not have the internal wire for positioning. Chip, Annalee's husband created the internal wire body making them mobile, henceforth - Annalee Mobilitee Dolls. * I recommend a TACKY GLUE called "Aleene's" for repairing Annalee Dolls. It is not affected by temperature changes, like the hot glue. - 74% feel that Reduced Prices are more important than Free Shipping. I want to extend my sincere thanks to all of my customers who took the time to respond to my survey. Your suggestions to improve suecoffee.com are always welcome.